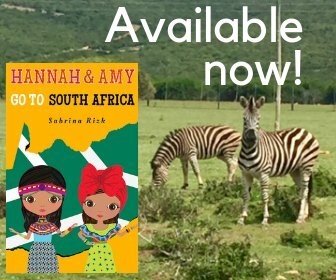 When we left Malaysia, Amy was tired of traveling and did not want to continue on. She had been wanting to go ice skating again, so on our first full day in Bangkok, Thailand, we went to Subzero Ice Skate Club in the Mega Bangna shopping center. The whole family got out skating and had a good time. This time the girls had a penguin they could hold onto, so had a lot more fun. I didn’t enjoy ice skating as a kid, but I had fun here. That’s Hannah in the background. She was zooming all over! 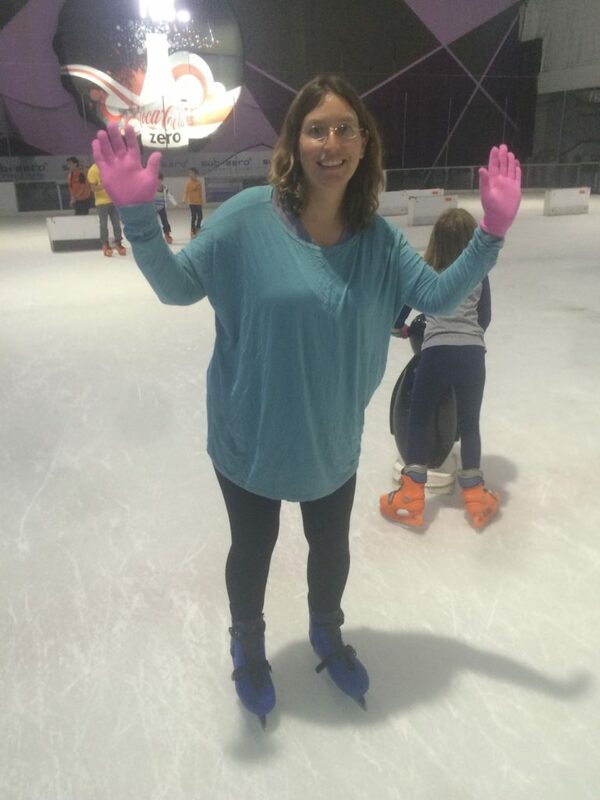 Anthony took to the ice rink too…Amy wouldn’t have it any other way! 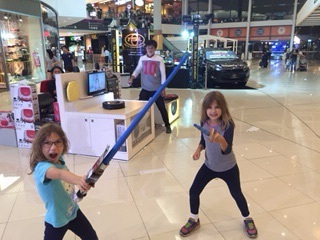 After ice skating, we went to see the new Star Wars movie (The Force Awakens), which everyone loved. The Thai national anthem is played before every movie, and you have to stand up for the duration of the anthem. 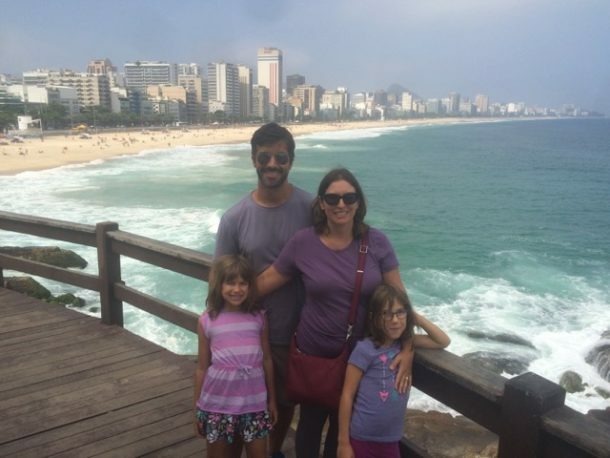 Other than that, it felt like a normal day out and helped make the traveling a bit easier for the girls. After the movie, we walked around the shopping center and came across a music store. 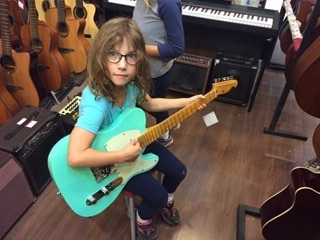 Amy found a teal electric guitar she really wanted. Unfortunately, this reminded her of wanting to go back to California to play guitar. 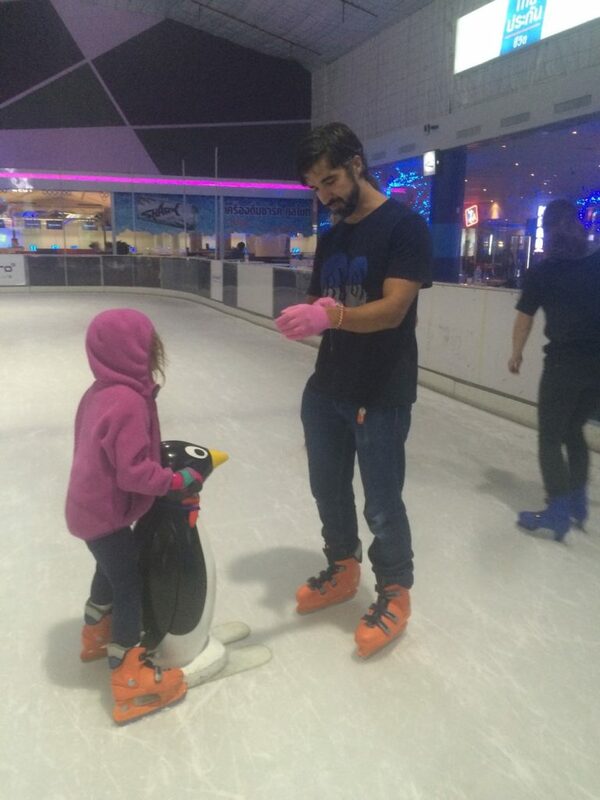 The next day, she was insistent that we had to go ice skating again…you can never please kids for too long! 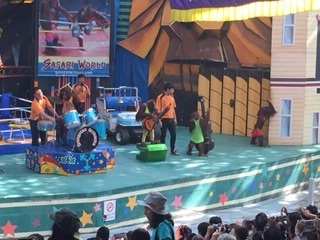 On our second full day in Bangkok we went to Safari World. When we woke up that morning, no one really wanted to go to it as we just needed another low key day. We had pre-booked the tickets to save money, so went anyway. Safari World is known for it’s animal shows, and we spent the day going from one show to the next. The orang utan show was quite gawdy, the seal lion, dolphin and elephant shows were okay. Hannah got a picture painted by an elephant (which we forgot in a restaurant in Chiang Mai!). Her favorite show though was the one non-animal one called Spy Wars…a James Bond type show with lots of pyrotechnics. The more I think about it though, the more I don’t like the concept of Safari World. I don’t think animals should be used to entertain us in this way. The Orang utan rock band. They also did Thai boxing. 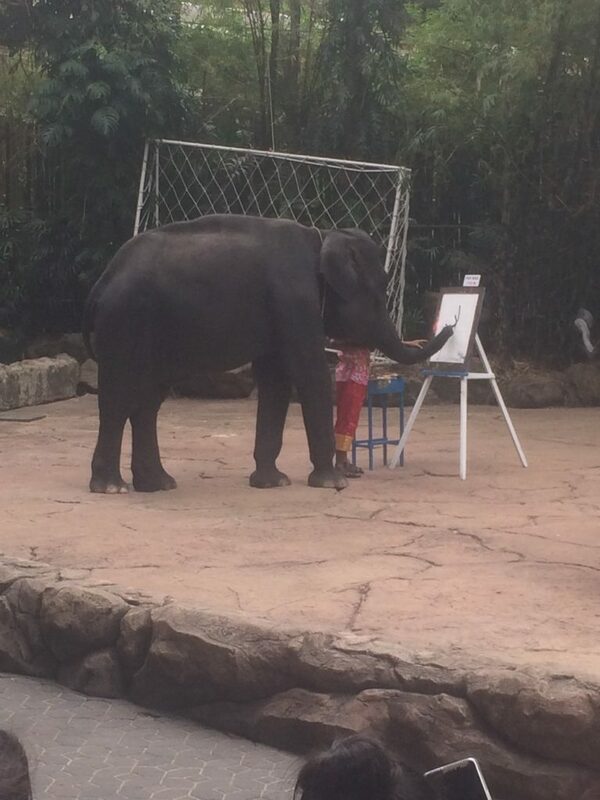 Three Asian elephants demonstrated their painting skills during the elephant show. Our introduction to Thailand went smoothly due to the very welcoming AirBNB host we had. Vittavas picked us up at the airport, drove us to and from both the shopping center and Safari World, and helped Anthony get a SIM card. This was great since the Thai language is not in Roman script and, according to our host, only 10% of Thais speak English. Bangkok has a population of over 10M, so we lost a lot of time in traffic. It took over 2 hours to get here from Bangkok’s downtown airport, where all the low cost flights land. Bangkok kind of reminds me of Toronto, Canada. It also makes me appreciate the decision to move electrical wires underground in Cupertino, California as they are quite the unsightly mess here. 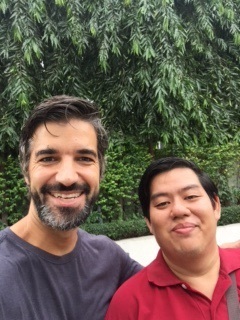 Anthony & Vittavas, our Bangkok AirBNB host. 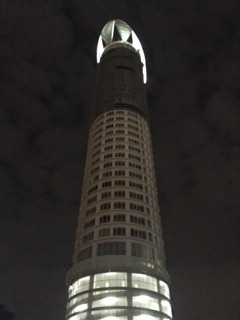 The condo tower we stayed in in Bangkok. After 16 weeks of travel, we are looking forward to some sleeping in time and pool time at the Dolphin Bay Resort. We wish everyone who is following our trip a very Merry Christmas from Thailand!